I guess the owners of the Republic Bar in Hobart have a sense of humour since they chose to that name for their pub. 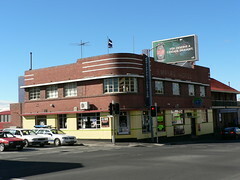 They are even flying the Eureka Flag, a symbol of rebellion, above the old Empire Hotel. Still, despite how I feel about the possibility of a future Australian republic, I wish they had just left it as the Empire.